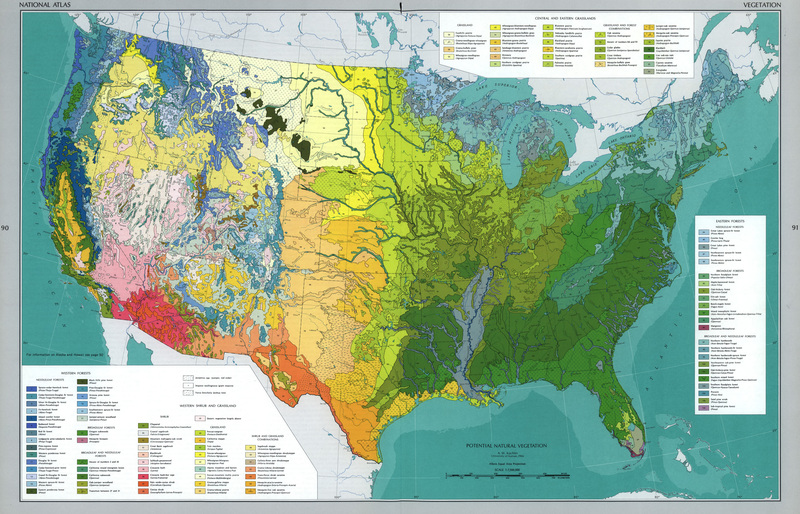 Detailed vegetation map in The National Atlas of the United States of America (USGS, 1970, Gerlach). This 1:7,500,000-scale map, in the Albers equal-area projection, has 119 vegetation classes for needle leaf, broadleaf, and combined broadleaf/needle leaf forests; shrubs; grasslands; and shrub/grasslands combinations; and grassland/forest combinations. Vegetation areas were symbolized using the colors in this style along with, for some classes, overlaid pattern fills.